If you don't have time for standing at the stove stirring, this baked risotto is for you! 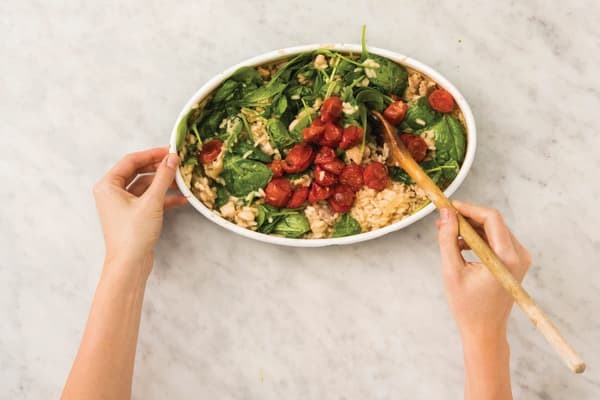 With chunks of tender chicken, sweet balsamic roasted tomatoes and leafy baby spinach, it comes together in the oven for a comforting bowl that feels like no work at all. Preheat the oven to 220°C/200°C fan-forced. Finely chop the garlic (or use a garlic press). Thinly slice the brown onion. Cut the chicken thigh into 2cm chunks. Zest the lemon to get a pinch, then cut the lemon into wedges. In a large frying pan, heat a drizzle of olive oil over a high heat. Add the brown onion and chicken and cook for 4-5 minutes, or until the chicken is golden. Add the garlic, lemon zest and arborio rice and cook, stirring, for 1 minute, or until fragrant. Add the water, the salt and crumbled chicken stock (1 1/2 cubes for 2 people / 3 cubes for 4 people). Bring to the boil and cook, stirring, for 2 minutes. 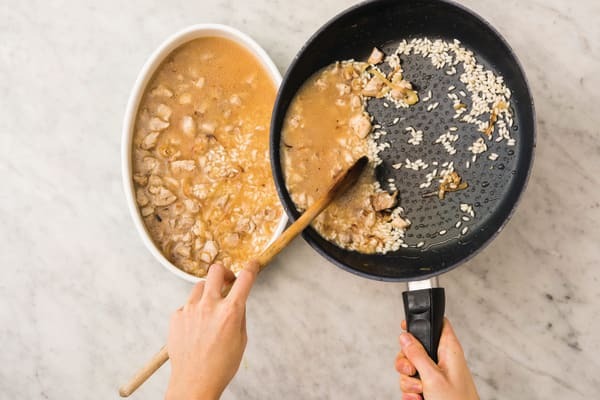 Transfer the risotto into a medium baking dish. Cover tightly with foil and bake for 24-28 minutes, or until the liquid has absorbed and the rice is ‘al dente’. Halfway through cooking, stir through a splash of water. 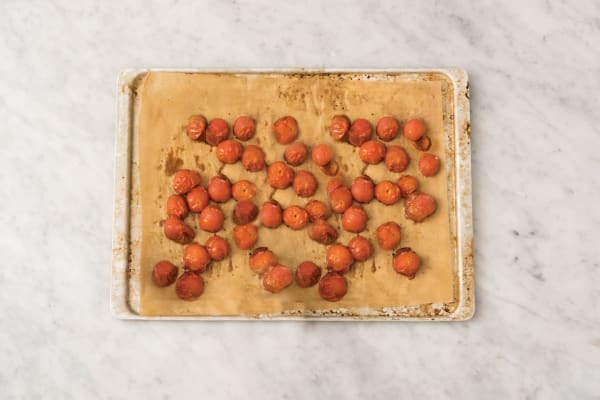 While the risotto is baking, place the cherry tomatoes (see ingredients list) on an oven tray lined with baking paper. Add the balsamic vinegar, brown sugar and olive oil (2 tsp for 2 people / 4 tsp for 4 people) and toss to coat. Roast for 18-20 minutes, or until tender and caramelised. 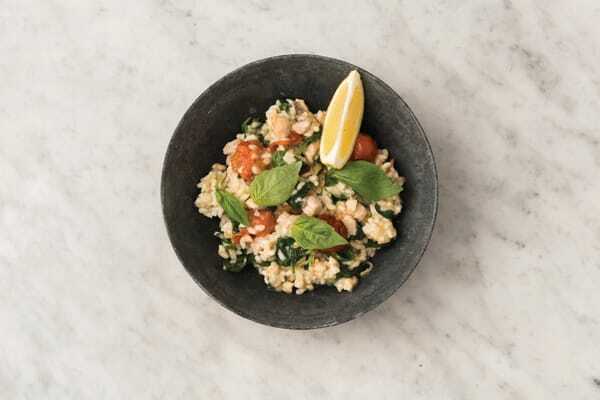 While the cherry tomatoes are roasting, pick and tear the basil leaves. Remove the baking dish from the oven and stir through the butter and grated Parmesan cheese until melted. Add the baby spinach leaves and stir until just wilted. Add the roasted cherry tomatoes and a squeeze of lemon juice and stir to combine. Cut the remaining lemon into wedges. Season to taste with salt and pepper. 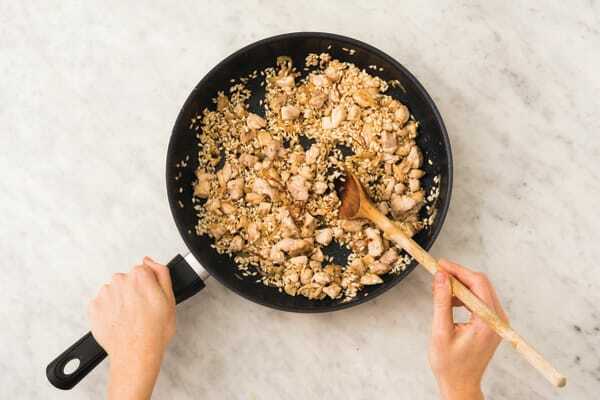 TIP: Seasoning is key in this dish, so add more lemon juice, salt or pepper if you think it needs it! 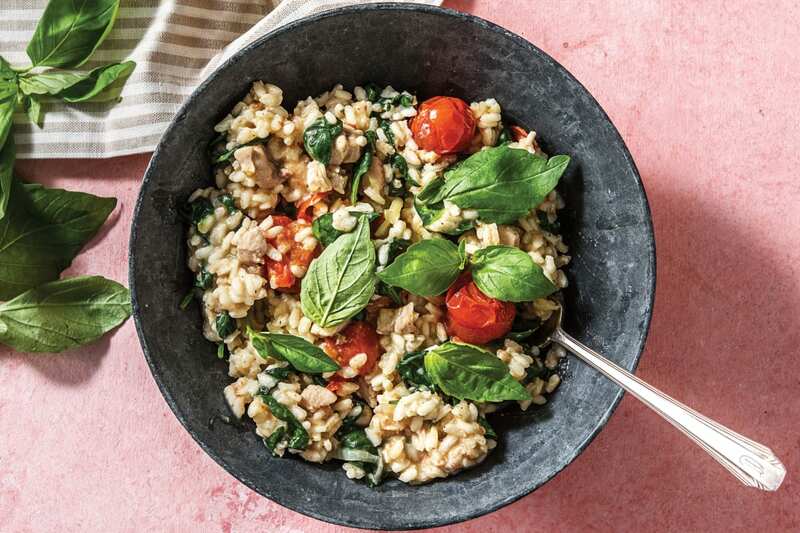 Divide the baked chicken and caramelised cherry tomato risotto between bowls. Top with the basil. Serve with any extra lemon wedges.